Share your love of camping with Girl Scouts - Loudoun Co., VA! Do you want to share your love of the outdoors with girls? Would you like to help girls to learn the skills they need to plan and organize a campout? Imagine teaching girls how to safely build a campfire, and then sittling alongside as they roast marshmallows to make S'mores! 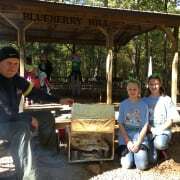 Girl Scout troops must have a Campout/Cookout Certified Volunteer in order to go camping, but not every troop has someone who has taken the training. You could be the volunteer troops need to camp at our property in Leesburg, VA.